Copperloy is the industry leader for high quality aluminum van ramps. An aluminum moving ramp from Copperloy is built to be durable and versatile, and will continue meeting your needs for years and years to come. Our moving van ramp collection can be manufactured in capacities from 2,500 to 4,000 lbs, widths of 38 to 44 inches, and lengths from 6 to 16 feet. Depending on length, they can also work with heights as high as 48 inches. All told, there are a dozen different standard models with various specifications sure to match your circumstances. To find the right ramp for you, contact us today and we’ll make sure you’re get the right ramp from the start. 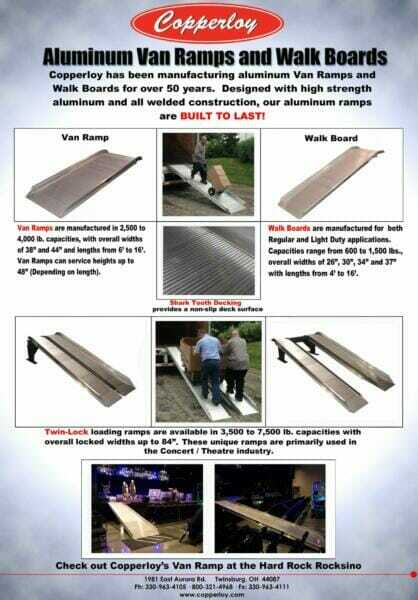 Aluminum van ramps are heavy duty but also light weight, and they’ll hold up to the conditions indefinitely. With 3 inch run off curbs and non-slip shark tooth decking, they’re safe to work with for you and your team. Additional features include a 12 inch lip, and 15 degree grade angles. Copperloy has been producing proudly American made loading dock equipment and aluminum van ramps for more than 60 years, and you can trust in our experience and expertise.